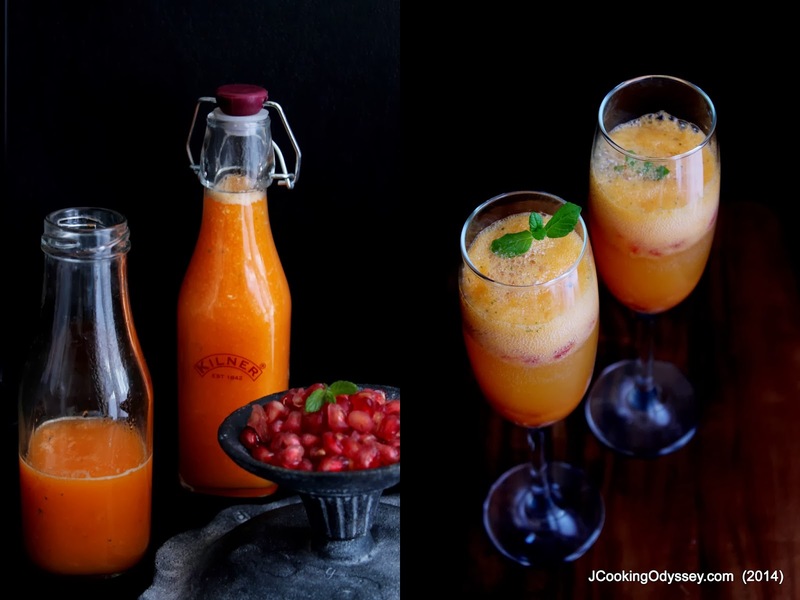 Jagruti's Cooking Odyssey: Clementine papaya fizz with Pomegranate seeds - My 4th Blog Anniversary with 500 th Post ! 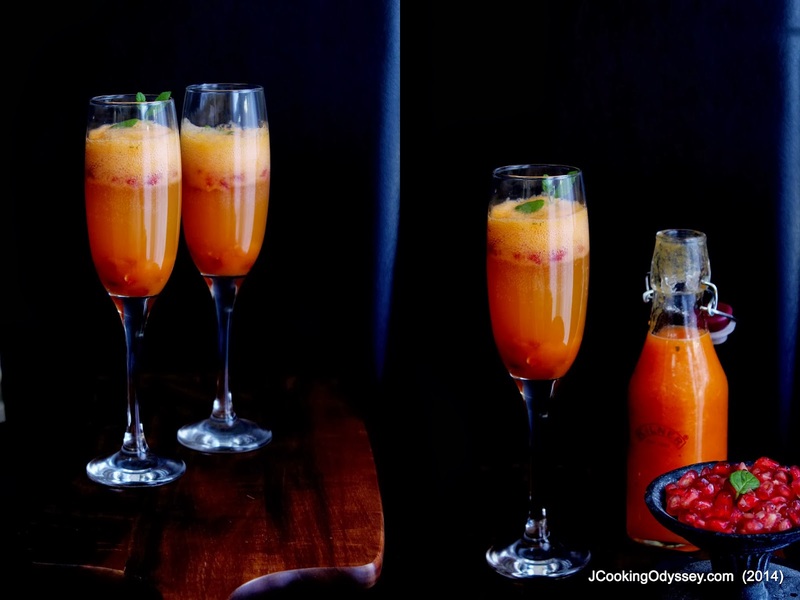 Clementine papaya fizz with Pomegranate seeds - My 4th Blog Anniversary with 500 th Post ! Blogging has made me a scrounger, a more greedy and a more messy person........but all in a positive way !! I can not believe that I took baby steps in the blogging world four years ago and posted my first post the exact same day. I clearly remember that day, how overjoyed and curious I was ! How eagerly I was waiting for my blog to appear on Google search and didn't have a clue how to take good pictures of the food, how to add all these hi-tech widgets on the blog and never imagined that blogging was commercial and certainly had no idea that blogging was a sport !! Many times when I go back to my old posts and pictures, I laugh :) please don't get me wrong, not that my current pictures can win any competition but it gives me some satisfaction that I am learning something new everyday and trying to achieve something in my creative field. No way, I will be re posting those posts again with better picture, those picture are my witness of how far I have come! I am more than satisfied that I survived all these years and I am posting my 500th post, my little blog is my hobby, a small place where I let my creativity wonder. 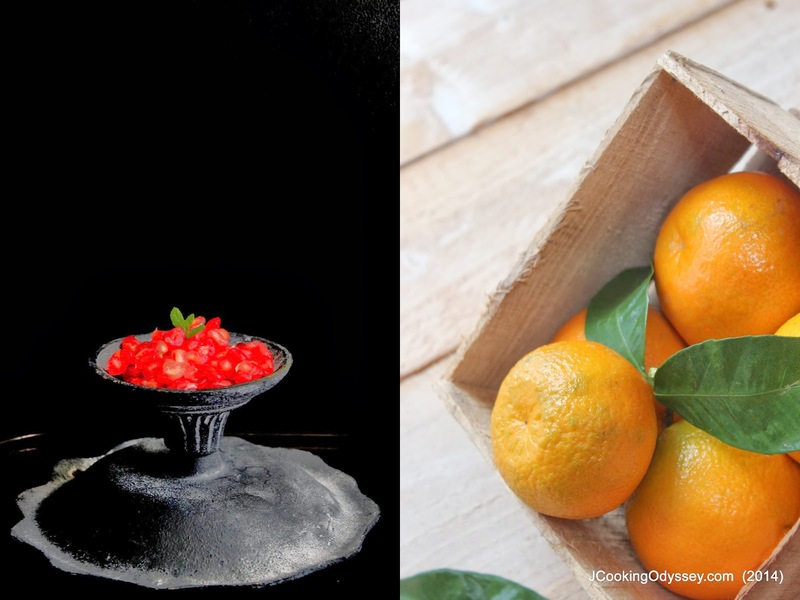 I have no desire to post hundreds of recipes in a year, neither do I want to achieve any popularity or becoming any professional in cooking or photography field. I don't blog so I can get receive freebies all of the time. Purely because I enjoy it! 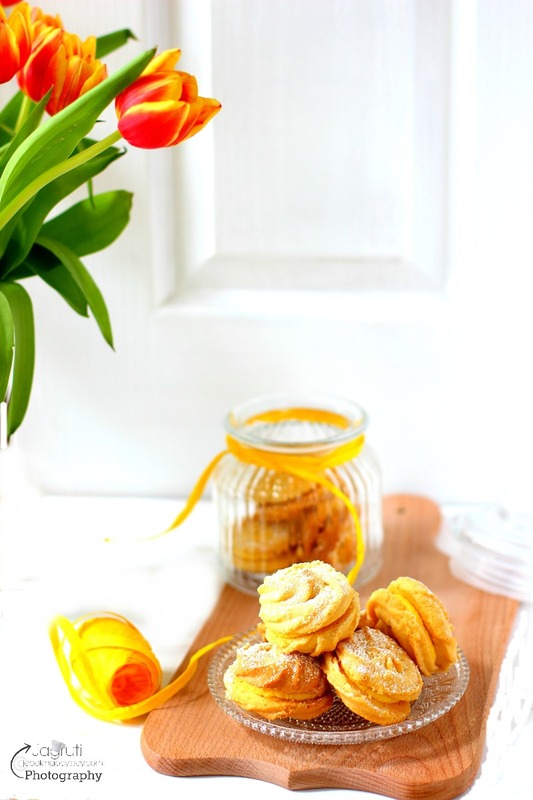 I do love blogging because I am totally engrossed with food, I love to eat food, love to make mess in my kitchen, I always look out or create new recipes which are healthy and nutritious. My eyes are always glued on cookery shows, if I visit the library my eyes are searching for a good cook book, in another way I celebrate food ! Of course I love photography and trying to learn basic photography and this is the platform to full fill my wishes. In these four years my family, friends and readers of JCO ... you all are always so kind to me, you've given me so much courage, support and always showered your blessings. I have never received any negative views or discouragement from my family or readers, maybe this is the reason I have become more greedy for more and more support and well wishes! I'm a scrounger because I am always looking for bits and pieces that I can use for my photos! A crisp leaf on the pavement, a pine cone that's fallen off the tree or a random wooden plank left in someone's skip! And let me tell you, I am not shy to knock on their door and ask for it!! Dosa, we're all absolutely crazy to eat them but could never succeed in making them at home. Always got nervous and almost gave up but thanks to the blogging world , met wonderful blogger and with her help Dosa is appearing regularly in our home :) So I must say glad I spent all these years with you guys !! Now onto today's recipe. 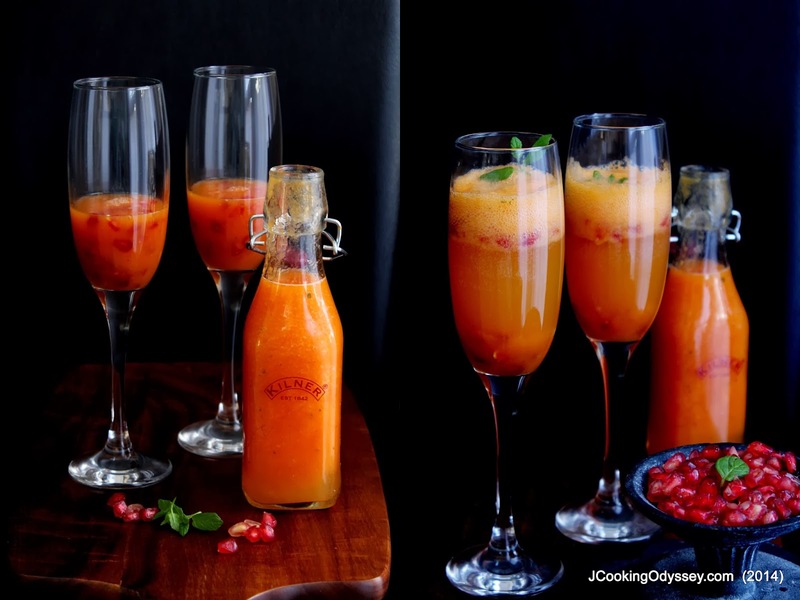 Clementine papaya fizz with Pomegranate seeds is a vibrant orange coloured, gorgeous, fragrant drink, certainly a eye catcher on any occasion and as much as satisfactory as any good alcoholic drink. It will uplift your mood and set your taste buds alight ! The addition of pomegranate seeds is so aesthetically pleasing that you just have to have a glass! It's an absolutely low calorie, abundant in vitamin C from clementine and papaya, ( Vitamin C, essential vitamin that we must get from food, as our bodies can’t make it. ) and skin purifying drink with a kick of ginger and mint, another contributing nutritional factor that fares in our favour, ONLY sophisticated !! 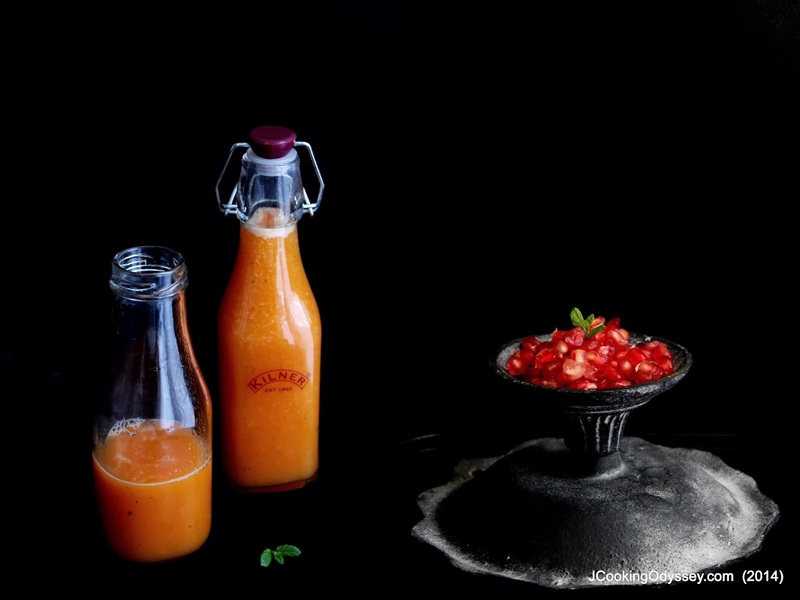 Place juice, papaya and mint leaves in a beaker or jug and blend with the hand blender. 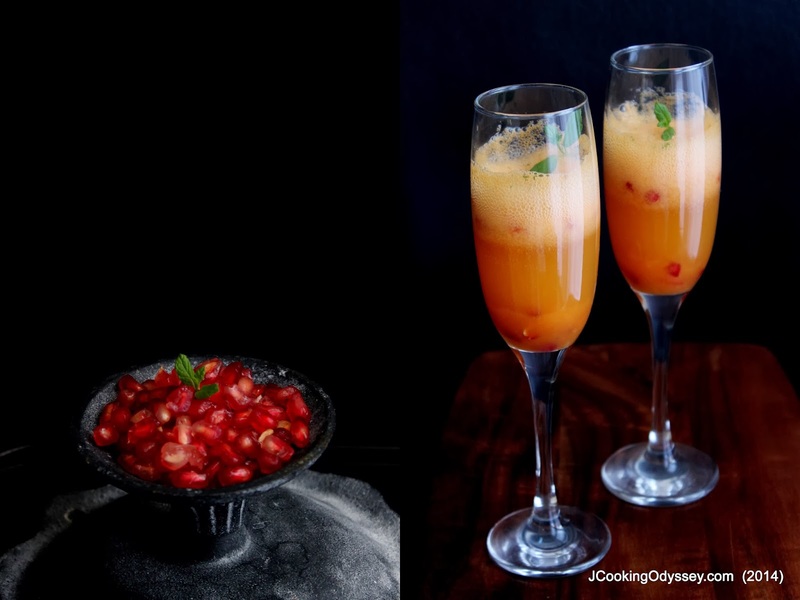 Divide the juice between champagne flutes and add spoonful of pomegranate seeds to each. If you wish sprinkle little chaat masala and garnish with the fresh mint leaves and serve immediately. Serve with any crunchy snack. 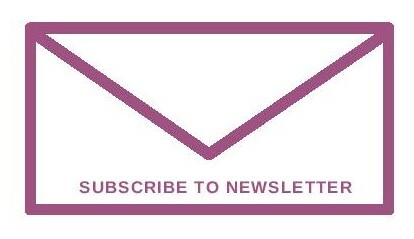 Happy belated blog anniversary, Jagruti! It's such fun to look back on all the previous years/posts and remember the love and effort that goes into each. 4 years is definitely a milestone! 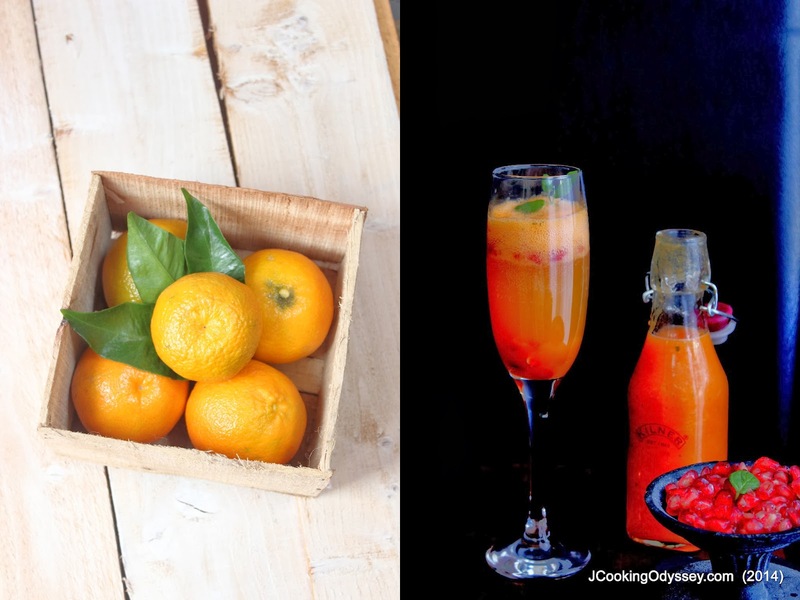 Here's to the next wonderful 4 years - these drinks look perfect for the celebration! Broccoli & Tofu Paratha ( stuffed flatbread ) !